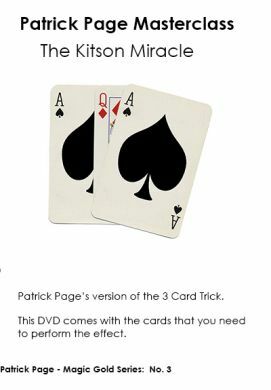 This is the 3rd in a newly released series of Patrick Page – Magic Gold DVDs. The DVD includes the gaffed cards that you need to be able to perform the trick. The Kitson Miracle is the Patrick Page version of the traditional “Find A Lady” or “Dutch Louper” trick. The 3 card trick has been around for a very long time. Sometimes known as the Three Card Monte, Find The Lady etc., The Kitson Miracle is based on a version called The Dutch Louper. It is in the style of the classic Three Card Monte, in which the spectators are invited to keep their eye on one court card (displayed openly between two number cards) , but somehow always seem to lose track of it. In this version, The Kitson Miracle, the court card vanishes right under the watchful eyes of the most astute spectator, leaving them rubbing their eyes in disbelief. In this DVD Patrick Page performs the effect plus many variations and then teaches you how to do it step by step. Many people think that “Kitson” must have been a magician but it was actually named after Kitson Road, Camberwell, London SE5 where the Page family lived at the time. This DVD ALSO includes the special gaffed card required to perform the effect. The Kitson Miracle DVD is priced at £20 (approx US $26.5) inclusive of free worldwide postage and packing (shipping). It is sent to you by first class post. Please make payment by Paypal. The DVD is a Pal version for use on Pal tv systems but should work on most computers. We are really informed by satisfied customers in the USA that the DVD works on both PCs and Mac computers. More information on this effect and others invented by Patrick Page are included in the Magic Page by Page Book available exclusively from Patrick Page Magic.